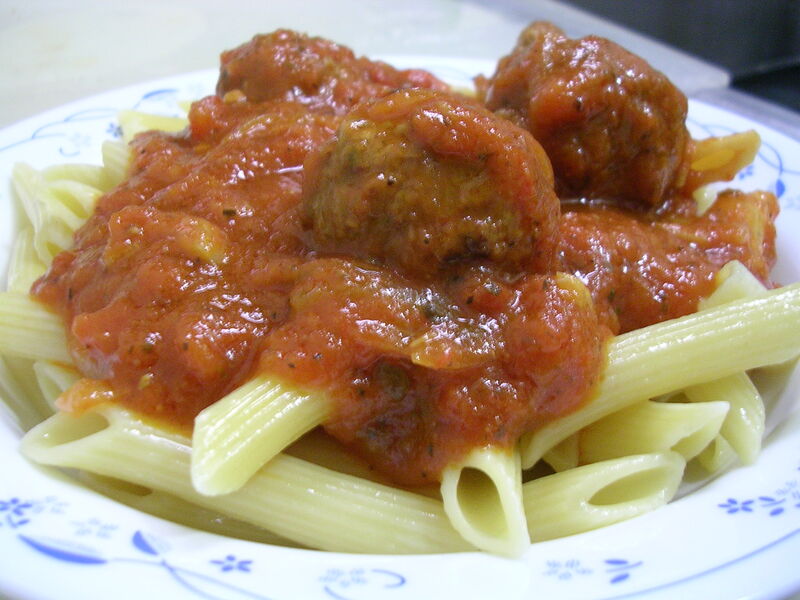 According to him, the sauce was made using a jarred pasta sauce from Classico (tomato and basil flavor), to which he added fresh garlic, onions, and seasonings. He also sauteed the meatballs before letting them simmer with the sauce, and the flavor was wonderful because you could really taste the meatiness in the sauce. I always get kind of disappointed when sauces are made separately from the meat, and combined at the end. By cooking the meat with the sauce, the flavor of the ground beef really came out and heightened the taste of the tomato sauce. Just wonderful, over the perfectly al dente ziti. This entry was posted on Monday, November 5th, 2007 at 12:50 am	and posted in cooking, Italian, Uncategorized. You can follow any responses to this entry through the RSS 2.0 feed.